Summary: Just in time for Halloween, this elegant collection of gothic stories based on a classic will chill you to the bone. In Edith Wharton’s original story, Kerfol, a cruel lord falls to his death and his much-younger bride is put on trial for murder. But she insists her abusive husband was killed by dogs – or the ghosts of the many dogs the man killed in order to keep his wife from having any hint of affection in her life. Author Deborah Noyes builds on this tale with five short stories about the haunted mansion, and the ghostly spirits who inhabit it. 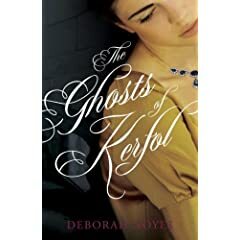 As the book progresses, we meet a young maid who was a witness to the original horrors of Kerfol, a young nobleman who has survived the French Revolution, a young American heiress, a couple on the rocks, and a deaf Irish gardener. Each has their own experience with the ghosts of Kerfol, and not all of them survive their hauntings. Who will like this book? : Fans of ghost stories and short fiction with dark twists and turns. If you like this, you should try: Noyes is also a terrific editor: Check out Gothic: Ten Original Dark Tales and The Restless Dead: Ten Original Stories of the Supernatural. If you loved the elegant writing of this book, try a classic by Edith Wharton, particularly my favorite, The House of Mirth. This entry was posted in Historical Fiction, Mysteries and Thrillers, Paranormal and tagged crime, ghosts, horror, intense, mystery, strange. Bookmark the permalink.